There is truth in the lyrics of this song.Our children are our future.What better place to teach them about sustainability of the Earth than through our school systems? 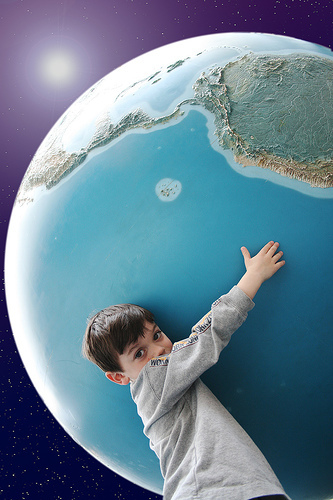 For this reason, in October, 2007, Edutopia launched its Go Green Database as a centerpiece of its ambitious plan to assist schools in teaching about environmental awareness.This resource includes an online user-driven database, short video documentations, and the entire October 2007 issue of Edutopia magazine. It also contained additional information to spur the teaching of our youth of the importance of sustainability and our impact on our environment. What is Edutopia? To give you some history, Edutopia was created by the George Lucas Educational Foundation (the creator of Star Wars) in 1991 to help reinvent our schools’ curriculum for the 21st Century. It highlights the best of the best in project based learning to teach your children to think outside the box.Stories of innovative teaching and learning have been disseminates to the Edutopia community via the website as well as magazine, e-newsletters, DVDs, and books. “Project-based learning, student teams working cooperatively, students connecting with passionate experts, and broader forms of assessment can dramatically improve student learning. New digital multimedia and telecommunications can support these practices and engage our students. And well-prepared educators are critical. How can the “Go Green Database” assist our schools? It is extensive and tailored to search your specific location, type of curriculum, age group, and whether or not such program has a cost.In addition, each teacher has the choice of a myriad of topics to teach, such as water, recycling, and habitat/ecosystems, as well as to the method of the lesson.The database provides resources such as curriculum, field trips, lesson plans, service projects, and speakers all geared towards your specific age group and topic.On the same page as the database are featured resources. Through out the website, parents and teachers are encouraged to rate and post comments as to the resource, thus creating a community of feedback among its users.Edutopia takes to heart the saying, “it takes a whole village to raise one child. ”Just to give you an idea of the database capacity, I searched NJ, middle school age, and no cost programs to see what type of programs were available. The only program available was an online tool, Urban Environmental Report, which asks the question, “how green is your city?”I investigated further and put in the query of curriculum.There were six pages of resources for me to choose from including the “Climate Change, Wildlife, and Wildlands Toolkit” to “Oceans Live.”Some of the lesson plans combined field trips in areas not in NJ. However, I had so much to pick from this did not seem to be a problem. This database is a great tool for all types of schools including home schooling, for lesson plans, online tools, and field trips right at your finger tips. Forward Edutopia’s Go Green database to your child’s teacher and principal. If you home school, consider integrating some of the lesson plans into your curriculum. Teaching “going green” has never been so easy.Make sustainability in our young part of their core not just a concept. They are our hope. Is there a version available for adults and particularly politicians? Anna, thanks for the kind remarks and encouragement. I started out writing a fiction blog but couldn’t stop myself from interjecting comments about the environment, so I started an additional site. For those who might be interested, fiction is found at http://nearlynothingbutnovels.blogspot.com/ . On the subject of education, I did write about the novels Flatland and Flatterland, which are about geometry in multiple dimensions (and the first book, dating to Victorian times, was quite subversive in its day, while still being a great way to learn about one, two, three, and four dimensions, and a little beyond). Anyway, back to the environment, I’m trying a mix of reporting and analysis, keeping an eye on conservation and related issues while trying to explain the confused and contradictory world of “green fuels”. I appreciate your remarks about my article on ethanol. I have no agenda except trying to work with others to figure out what we should really be doing (individually, collectively, nationally and internationally), and offering my background in chemistry and other sciences to help interpret things. I would say that one major problem of the moment is confusion of these two issues: (a) freeing ourselves from foreign oil dependence and (b) improving or saving the environment by eliminating or minimizing pollution (including, but not limited to, minimizing greenhouse gases). These two goals are not necessarily very compatible, at least with current technology, though “current” technology, as in electricity and electric cars, trams, trains, & buses, may be the best of both worlds. It isn’t, however, going to be carbon neutral without a lot more nuclear power plants, and I’d rather not have any of those around. I guess one frustration I feel is the lack of sustained interest in conservation by so many in the the US (huge cars, etc.). Another would be the complete lack of any sensible policies, or even sensible comments, from most politicians. That doesn’t stop them from using up tax money for flawed programs. The WSJ today had a great article on how to make “financial disciple” part of kids behavior with about 15 tips and suggestions. Many of their comments came from readers. Might be a great idea to start a poll/survey from readers here to comment on how to teach this early. I’d bet you could turn it into a great (and widely read) article.